The 9-5 was the company's executive choice, a smart-suited Swedish alternative to the norm from Germany's Audi A6, BMW 5 Series and Mercedes-Benz E-Class. Always a company to carve its own path, Saab's demise in recent years shouldn't put you off a used example - quite the contrary, even. The 9-5 was the company's executive choice, a smart-suited Swedish alternative to the norm from Germany's Audi A6, BMW 5 Series and Mercedes-Benz E-Class, though the Saab's more natural rival would perhaps be something from rival Swedish firm Volvo's showrooms. Introduced in 1997 the 9-5 was on sale for 12 years, before being replaced by a short-lived all-new car. Available as a four-door saloon or capacious estate, the 9-5 was and remains a solid and dependable - if slightly quirky - choice for those wanting something a bit different. The 9-5 is a spacious car in either body style, but the estate is particularly sought after if you're partial to picking up furniture or have a lot of stuff to haul around. In typical Saab form the details make the difference, those estates having a useful slide out boot floor to ease loading for instance. Other clever touches inside include Saab's night panel, which, linking to the firm's aviation history, blacks out all but the key instruments to avoid fatigue when driving at night. True to form there's a transmission tunnel mounted ignition key, which all Saabs feature as part of their extensive safety and security arsenal. The 9-5's chassis might be front-wheel drive, but unless you're prone to pushing your car to the very limits this isn't an issue. The more powerful of the turbocharged engine line-up may cause a little squirm at the steering wheel as it puts its power down, but despite the useful power across the entire range the 9-5 doesn't ask too much of its chassis. All the engines are turbocharged in a bid to provide good economy mixed with decent performance, meaning even the smallest four-cylinder units give ample power. Manual transmissions are fitted to most, though the V6s gained an automatic as standard. The line-up consisted of 2.0- and 2.3-litre turbocharged four-cylinder petrol units, a 3.0-litre V6 petrol and a 2.2-litre turbodiesel four-cylinder and 3.0-litre V6 turbodiesel. The trim line-up from 1997 to 2001 was simply a standard car, SE or performance orientated Aero. 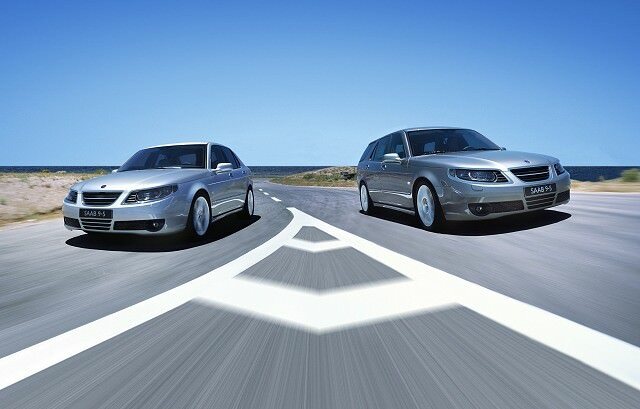 Saab's revisions in 2001 saw it gain Linear, Arc, Vector and Aero trim lines, and the later facelifted cars in 2006 - obvious thanks to chrome trim around the headlights - retained the same trim lines. A 1.9TiD turbodiesel replaced both the 2.2- and 3.0-litre turbodiesel offerings in the line-up. Saloons are more common, and unless you really need the extra space (the saloon's boot isn't lacking in capacity) then it's the one to go for. Engine choice in Ireland is predominantly made up of the 2.0 turbo or the 2.3 turbo, the larger unit giving a slight boost in performance and no real penalty in economy. Trim line depends on budget, but even the entry-level Linear won't leave you wanting for much. A credible alternative to the Germanic norm, the Saab 9-5 might be a touch leftfield, but that's part of its appeal. Decent choice and sensibly priced used the 9-5 should prove a safe buy for people looking for a large, comfortable and spacious saloon or estate.